Just off the phone with our friends at Schachenmayr and James C Brett. We have been sharing with them some of the examples of Mad Hatter excellence by our audience. They quickly realized that it’s going to be a really tough choice to pick the top 5. They wanted to help out and add more prizes for more people. 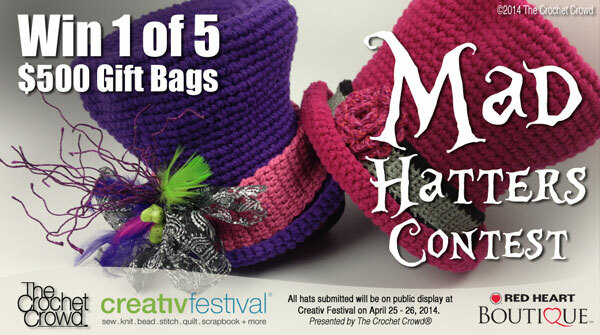 The top 5 Winning Hats are going to receive $500 in prizes compliments of Red Heart Yarns, Creativ Festival and The Crochet Crowd. Ten runners up will be chosen to receive a $50 Yarn Sampling Package of exquisite yarns from Schachenmayr and James C Brett. We thank them greatly for their contribution and recognizing our crocheters for providing these generous gift packages. This entry was posted in Announcements, Crafting Shows, Crochet Challenges and tagged Challenge, Contest, Creativ Festival, crochet crowd, James C Brett, Mad Hatter, Red Heart Yarns, Schachenmayr, Show. Bookmark the permalink. I am sure that no one expected the superb collection of hats! So happy to know that there will be more prizes…from the hats that I saw, they should ALL get a prize. I now have an inferiority complex about my crochet talents after seeing all of these awesome, creative and so very cleverly designed and created hats!! Everyone who entered is a winner!! That is a very sweet gesture! Thank you. With more than 300 hats, the competition is intense, which means more deserving prestige for the winners. Best wishes, Mad Hatters! That is so awesome! I can’t wait to see all the entries. I am most excited about my hat getting to go to Creativ Festival since I can’t go. I hope someone bids on it to help out the charity.